(NaturalNews) A leading scientist with the Centers for Disease Control and Prevention whose noted "Denmark Study" ostensibly disproved any link between vaccines and autism as well as additional neurological disorders is now fleeing justice with nearly $2 million he allegedly was to spend on research. 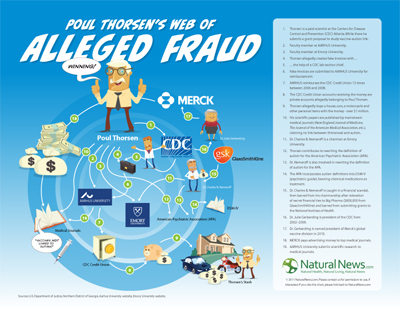 As first reported in April 2011 by Natural News editor Mike Adams, the Health Ranger, Dr. Poul Thorsen was indicted by a federal grand jury in Atlanta on charges of wire fraud, money laundering and defrauding research institutions of grant money. That report came after a May 2010 report in The Huffington Post noting that Thorsen fled with the money as Danish police launched an investigation into alleged fraud involving millions of taxpayer dollars over time. Adams noted that Thorsen "is a scientist who formerly worked for the CDC, and over the last several years, he oversaw millions of dollars in grant money that was used to conduct research to 'prove' that vaccines have no link to autism." One of Dr. Thorsen's research papers is the famous "Thimerosal and the occurrence of autism: negative ecological evidence from Danish population-based data" study. You can see that study published here. Adams said the paper concluded that thimerosal, the mercury-based preservative that is used in vaccines globally, has no statistically significant link to autism. Thorsen's piece was a key paper used by vaccine proponents who argued that thimerosal is safe to inject into children. Adams noted that the fact that Dr. Thorsen's "credibility is now being called into question by a federal indictment of fraud and money laundering will, of course, have ripple effects throughout both the vaccine industries and autism support groups." His study has long been criticized as fraudulent since it failed to disclose that the increase was an artifact of new mandates requiring, for the first time, that autism cases be reported on the national registry. 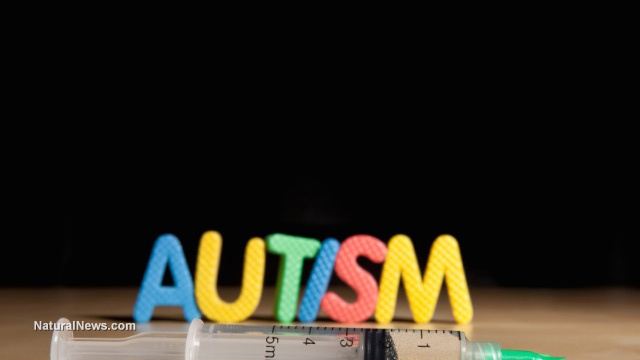 This new law and the opening of a clinic dedicated to autism treatment in Copenhagen accounted for the sudden rise in reported cases rather than, as Thorsen seemed to suggest, the removal of mercury from vaccines. Despite this obvious chicanery, CDC has long touted the study as the principal proof that mercury-laced vaccines are safe for infants and young children. According to the indictment, Thorsen was given millions in grant money dating back to the 1990s. In 2002, he moved to Denmark and became the "principal investigator" for the grant money, responsible for administering the research money that the CDC awarded. Between 2000 and 2009, he received some $11 million in awards. Adams cited the Justice Department's indictment that said Thorsen allegedly skimmed money by submitting fraudulent expense statements that were falsely tied to the Denmark study. As HuffPo further noted, Thorsen wasn't even a research scientist or toxicologist - he was a psychiatrist. Nevertheless, he parlayed his initial autism study into a taxpayer-funded cash cow in the form of a long-term relationship with the CDC. He managed to build a research empire of sorts called the North Atlantic Epidemiology Alliances, or NANEA, which boasted a close relationship with the CDC's autism team. It was a relationship that "had the agency paying Thorsen and his research staff millions of dollars to churn out research papers, many of them assuring the public on the issue of vaccine safety," HuffPo reported. Thorsen's shenanigans have forced leading independent scientists to question the CDC's judgment, his research in particular, and why the agency has gone to some effort to conceal the vaccine-autism link in mercury-laced injections beginning in 1989 with the epidemic of autism and other neurological disorders that have affected generations of American children. Now awaiting extradition to the U.S. According to the Department of Health and Human Services Office of Inspector General's web site, Thorsen remains in custody in Denmark awaiting extradition to the United States. The indictment says that, from "approximately February 2004 until February 2010, Poul Thorsen executed a scheme to steal grant money awarded by the Centers for Disease Control and Prevention (CDC). CDC had awarded grant money to Denmark for research involving infant disabilities, autism, genetic disorders, and fetal alcohol syndrome." The HHS IG has accused Thorsen of allegedly diverting more than $1 million of the CDC grant money to his own personal bank account. "Thorsen submitted fraudulent invoices on CDC letterhead to medical facilities assisting in the research for reimbursement of work allegedly covered by the grants," says the IG's Web summary on the indictment. "The invoices were addressed to Aarhaus [sic] University and Sahlgrenska University Hospital. The fact that the invoices were on CDC letterhead made it appear that CDC was requesting the money from Aarhaus University and Sahlgrenska University Hospital although the bank account listed on the invoices belonged to Thorsen." In April 2011, Thorsen was brought up on charges on 22 counts of Wire Fraud and Money Laundering. According to bank account records, Thorsen purchased a home in Atlanta, a Harley Davidson motorcycle, an Audi automobile and a Honda SUV with funds that he received from the CDC grants. Adams reported that Thorsen faces 13 counts of wire fraud and 9 counts of money laundering after speaking with the Justice Department. In total, Thorsen could be sentenced to some 260 years behind bars just on the wire fraud charges alone; he could get an additional 90 years in prison for money laundering and face more than $22 million in fines. For its part, Aarhus University sought to sever its ties with Thorsen in 2011. "Unfortunately, a considerable shortfall in funding at Aarhus University associated with the CDC grant was discovered," the university said in a statement. "In investigating the shortfalls associated with the grant, DASTI and Aarhus University became aware of two alleged CDC funding documents as well as a letter regarding funding commitments allegedly written by Randolph B. Williams of CDC's Procurement Grants Office which was used to secure advances from Aarhus University. Upon investigation by CDC, a suspicion arose that the documents are forgeries."